The NBA season has officially begun and there are three major teams that come to mind when the time comes to pick who will be #1: The Cleveland Caveliers, the Boston Celtics, and the L.A. Lakers. The Celtics have a history of being the best team in the NBA, the Cavaliers were the Eastern Conference regular season champions last year, and the Lakers, who also have a history of being the best in the NBA, are the defending champions from. They also went to the NBA finals two years ago, where they fell 4-2 to the Celtics. The Boston Celtics, who began their season this year with a 95-89 win over the Cavaliers in Cleveland, finished their season last year with a record of 62-20. They had the second best record in the Eastern Conference behind Cleveland. They won their first playoff series against the Chicago Bulls, 4-3, and then fell 4-3 to the Orlando Magic. The Celtics were the NBA champions two years ago when they finished with the best record in the NBA and eliminated the Lakers in game 6 of the NBA finals with a commanding 131-92 victory. Last year, the Celtics began their season strong, with a record of 27-2. Later in the year, Boston lost Kevin Garnett, and the remainder of their season was a struggle. With Garnett back this year, and having already defeated Cleveland on their home court, Boston is sure to be one of the best teams in the NBA. 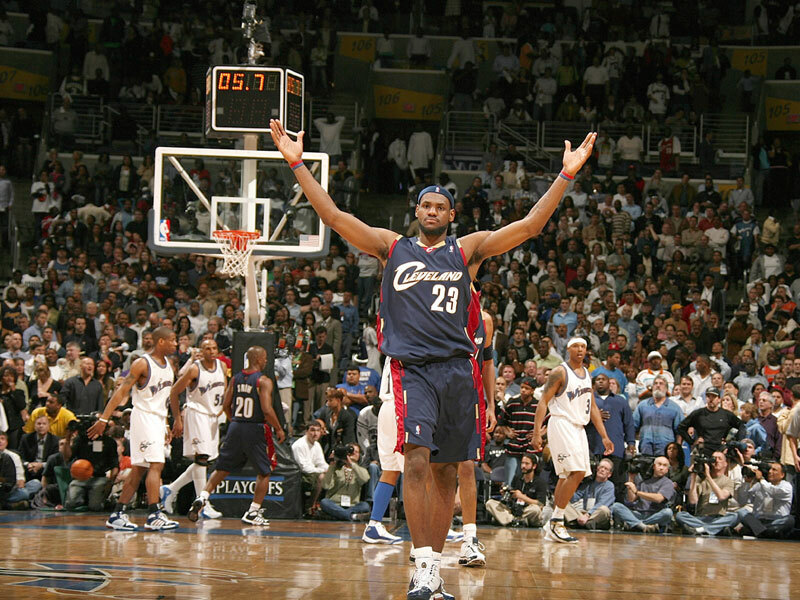 When one thinks of Cleveland Caveliers, one person comes to mind: LeBron James. Well this year, he’s not the only player on Cleveland the Cavaliers’ opponents have to worry about. This year the Cavaliers have signed Shaquille O’Neal to their roster, a 37 year old star who’s still playing strong. Cleveland finished their regular season 66-16 last year, the best record in the NBA. They swept their first two playoff series, wiping out the Detroit Pistons and the Atlanta Hawks, and defeated both teams each time by more than 10 points, which is something that is extremely rare for a team in the NBA to accomplish. The Cavaliers fell 4-2 to the Orlando Magic last year in the Eastern Conference finals, which was a shock to everyone. This year, they already have their first loss to the Celtics. That loss is also the first time in a long time that Cleveland and Boston played and the home team didn’t win. So the Cavaliers will undoubtedly turn out to be one of the best teams in the NBA this year, but in order to do so, they’ll need to shape up the next time they play an opponent like Boston. 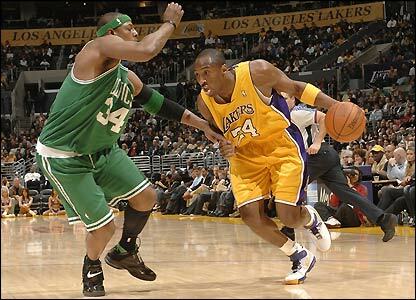 When a person thinks L.A. Lakers, the hot player that comes to mind is Kobe Bryant. The only player who beat Bryant out for MVP last year was LeBron James. Bryant and the Lakers are this year’s defending NBA champs, and they’ve already opened their season with a 99-92 victory over the Clippers. Last year they finished their regular season 65-17, which was the second best record, behind the Cavaliers. The Lakers are a pretty good team. They always have been and no other teams in the Western Conference can really match up to them. They’ll most likely be the Western team to bet on when NBA playoff time comes around. Boston, Cleveland and L.A. will each have their struggles this year, and there are other teams who could come on strong and turn out to be #1. You never know in the NBA. However, most likely when the playoffs roll around, you can expect to see all three of these teams in contention. When it comes time for the finals next June, one of these three teams will almost be a sure bet. So let the race for the #1 team in basketball begin. Remember now that the NBA season has started and it won’t be long before college picks up as well. The scent of basketball season is already starting to fill the air. This season is about personal style more than ever. Whether you decide to be a fashion chameleon or you tend to stick to one look, this fall season offers something for everyone. This fall is about personal style, and there are many trends appearing. Each week I am going to focus on a new trend springing up. This week we are delving into the world of Boudoir style for all you sensual vamps out there. I am loving this seasons Parisian-inspired looks. Now this is a very tricky look to pull off, so let me go through the fabrics and accessories one-by-one. It’s getting close to the end of October and Halloween season is on everyone’s mind. There are three phases that a person goes through when Halloween rolls around, and each one involves being dressed in a costume; whether it’s creepy, cute, or just plain hilarious. Halloween is the time of year when people get to show off, use their imaginations and just go out and have fun. It’s the time when a kid can eat all the candy he or she wants, and mom and dad won’t tell you not to (this is assumed of course). It’s a time when people may come up with clever ways to scare those who enter their front yards, and of course, there’s the pranks and the parties. The first phase of Halloween for everyone will probably bring back plenty of childhood memories: Trick-or-treating. Kids dress up in whatever costumes they want, go out into the neighborhood and collect as much candy as they can from the neighbors who will have a bucket, bowl or basket of goodies waiting. Halloween is always fun for children. It’s always nice to answer your door and see what the neighborhood kids came up with for their costumes this year. For some neighbors, it might be the only time that the neighborhood kids are happy to see you. All children need to know how to do for halloween is say two things, “trick-or-treat!” and of course, “thank you” (it’s good to be polite). This is the phase that not everybody goes through for Halloween, usually only kids who like to be daring. Obviously trick-or-treating becomes overrated eventually. Kids will stop wanting to do it because the older they get, the more it begins to feel a childish. So when kids become adolescents, what are they to do on Halloween night? There’s only one fun thing to do: go out and prank the neighbors houses. Pranks consist primarily of a house being bombarded by eggs, or covered in toilet paper. Pranksters usually come out late too, after all the children are done trick-or-treating. Getting caught in the act of performing these pranks by the cops is a guarenteed arrest, but that doesn’t make it any less fun. This is the final phase before a person becomes a parent handing out candy. Seeing as this is Radford, most people know this phase all too well. It gets to be later in the teenage years, coming out of high school and going into college. Trick-or-treating is overrated, and even pranking the neighbors’ houses seems kind of immature now, so what does that leave? There’s only one thing left to do, and here at Radford, it’s a year-round deal: partying! In college, that’s the only thing students think about when they think of Halloween, partying. It’s always fun to see what clever costumes people can come up with. Halloween is the one night that a college student can go out and be someone other than themselves. After going through all three of these phases, usually the only thing left to do is get a house and start handing out candy to the kids as you watch them begin their Halloween adventures. Also, be sure to keep an eye out for pranksters, they won’t approach anyone’s house who’s watching them. Halloween is a great holiday. From all the staff of the Whim, we wish you a happy Halloween!